“One of the most significant milestones in the history of the Cork Branch of I.G.R.M. was Friday 20th January when the group played an important role int he Cork-about program “Homosexuals in Cork”. 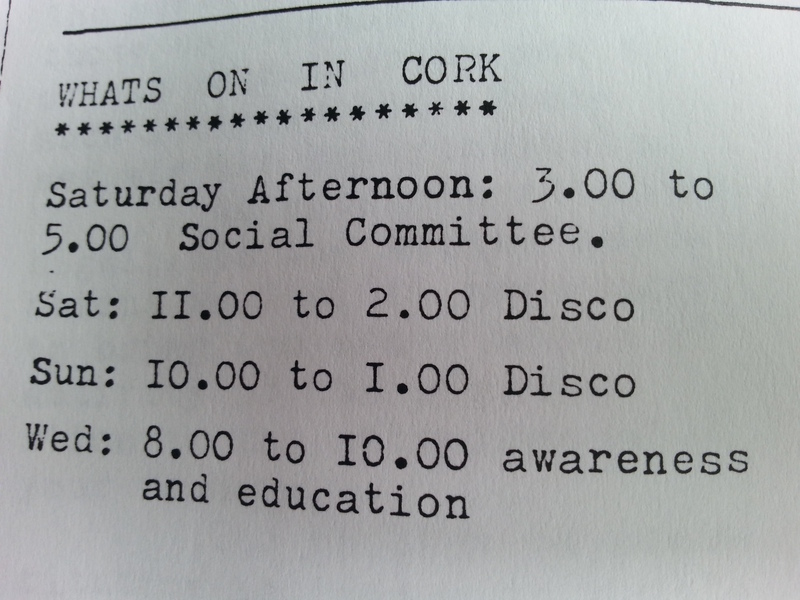 The programme was researched and devised by Anne Daley of the Cork Studio. We must express our warmest thanks to Anne and the staff of R.T.E. for the cordial welcome and treatment we received from them. 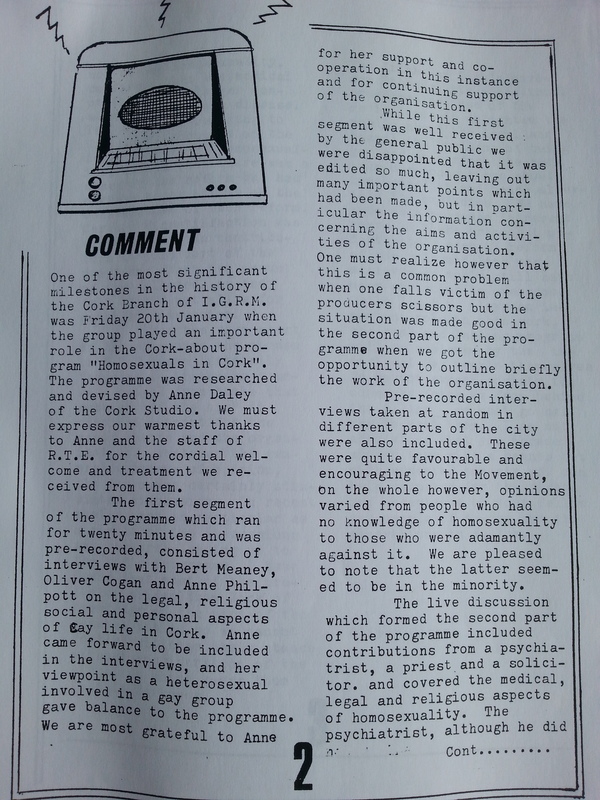 The first segment of the programme which ran for twenty minutes and was pre-recorded, consisted of interviews with Bert Meaney, Oliver Cogan and Anne Philpott on the legal, religious social and personal aspects of gay life in Cork. Anne came forward to be included in the interviews, and her viewpoint as a heterosexual involved in a gay group gave balance to the programme. We are most grateful to Anne for her support and co-operation in this instance and for continuing support of the organisation. While this first segment was well received by the general public we were disappointed that it was edited so much, leaving out many important points which had been made, but in particular the information concerning the aims and activities of the organisation. One must realize however that this is a common problem when one falls victim of the producers scissors but the situation was made good in the second part of the programme when we got the opportunity to outline briefly the work of the organisation. Pre-recorded interviews taken at random in different parts of the city were also included. These were quite favourable and encouraging to the Movement, on the whole however, opinions varied from people who had no knowledge of homosexuality to those who were adamantly against it. We are pleased to note that the later seemed to be in the minority. The live discussion which formed the second part of the programme included a psychiatrist, a priest and a solicitor and covered the medical, legal and religious aspects of homosexuality. The psychiatrist, although he did not define homosexuality, confirmed that the medical profession no longer consider it to be a disease. 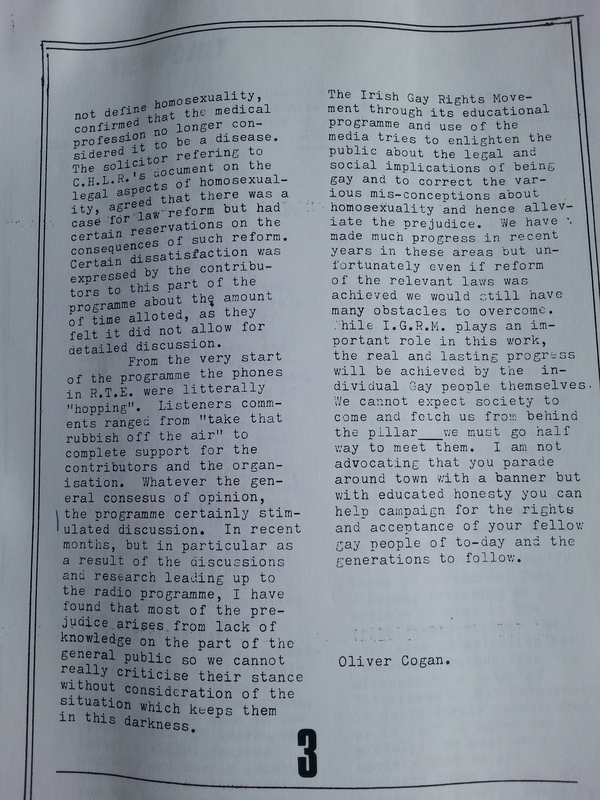 The solicitor referring to C.H.L.R.’s document on the legal aspects of homosexuality, agreed that there was a case for law reform but had certain reservations on the consequences of such reform. Certain dissatisfaction was expressed by the contributors to this part of the programme about the amount of time allotted, as they felt it did not allow for detailed discussion. From the very start of the programme the phones in R.T.E. were literally “hopping”. Listeners comments ranged from “take that rubbish off the air” to complete support for the contributors and the organization. Whatever the general consensus of opinion, the programme certainly stimulated discussion. In recent months, but in particular as a result of the discussions and research leading up to the radio programme, I have found that most of the prejudice arises from lack of knowledge on the part of the general public so we cannot really criticize their stance without consideration of the situation which keeps them in this darkness.